Loess soil lose its strength and suffer severe volume change when it get saturated. This behavior of loess makes it susceptible to supported foundation. The volume change is the most prominent structural and physical property of it. This collapse with contact of water is sometimes called hydroconsolidation, sometimes called hydrocompaction. Montmorillonite present in loess soil as clay mineral has great sensitivity to moisture producing an unstable soil structure. Consolidation always associated with settlement which is unexpected in foundation design, at least up to certain tolerance. We are discussing about montmorillonite in our previous many posts; here we like to provide some information about its properties and structure. Details of it will be discussed in our upcoming post where we are going to provide clay mineralogy and soil structures, to explain different properties of soil at micro level. 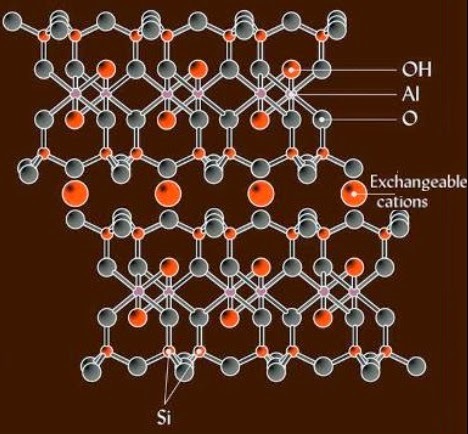 The mineral structure of montmorillonite is such that exchangeable ions and water can easily take place between layers which can cause layers to separate. It is provided that montmorillonite is formed by sandwiching of silica sheets and octahedral sheets. So we have idea about affinity of montmorillonite to water. This structure makes its susceptible to large volume change which can be determined by activity of clay soil as discussed in previous post. The montmorillonite swells when it gains water into its lattice structure and reverse when water is removed from it due to seasonal or other causes. It has low internal friction and high plasticity when it is in moist state. Now a question may arise, under saturation montmorillonite swells, why does loess settle or collapse under saturation? The answer is swelling behavior is valid when total swell mass has majority portion of clay (montmorillonite). But in loess there have little clay content that just coat silt particles and shows temporary cohesion resulting high strength before getting wet. When loess soil gains moisture, the bonds provided by clay content and also calcite (low content) becomes weak and dramatically reduce soil strength from its previous dry state. Thus, saturation of loess soil results consolidation of it under much lower stresses than that of dry. Thus in hydroconsolidation, loading is not only key factor for consolidation of soil, which is often less important contributor than moisture variation as this soil may collapse only under saturation even application of little or no loading.